Our carriers should not be confused with other carriers of a similar appearance advertised and supplied elsewhere. We stress that we have set our own unique specification and all our carriers are now discreetly stamped with our company initials "VMGP" to avoid any confusion with others which may be available. Our specification is not available elsewhere irrespective of what any other MMM supplier may have tried to claim. Having carefully researched several original examples, Vintage MG Parts have identified that the thickness of the original steel strips were somewhere between 14 and 16 gauge and were made of mild steel with galvanized finish. The majority of reproduction spare wheel carriers to date, appear to have been made in 16 gauge although Vintage MG Parts have deliberately specified 14 gauge to give that thicker quality appearance. We have chosen to have these made in a polished stainless finish in order to avoid problems associated with chroming and cracking to welds. The Vintage MG Parts specification spare wheel carrier also differs to others in that it is designed with flexibility to correctly accommodate the Blockley 4.50 28 1/4 inch diameter tyre. The 4.50 Blockley tyre is larger in diameter than many other standard 4.50 tyres but is becoming the most popular for MMM cars. Standard commercially available carriers which are being used to hold the Blockley cannot generally centralise the octagonal central badge plate being up to an inch off centre. Not ours though. Please note however that our carrier cannot take the larger 28.70 inch diameter 4.50 Comp H Excelsior tyre without compromising the appearance of the carrier. There is also an additional difference to those advertised and supplied elsewhere. 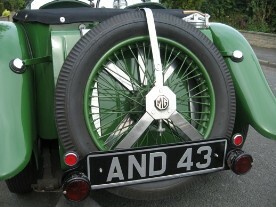 We can also supply the enamel MG spare wheel carrier badge and Lucas ST38 style 'pork pie' tail lights.